Where are the beach vacation rentals located? Sleeping Sea is on the north shore of Orcas Island, WA about a 5 minute drive to the center of Eastsound. It is located in the town limits, but on the outskirts of town. Our property is in a quiet neighborhood on a private dead end road. 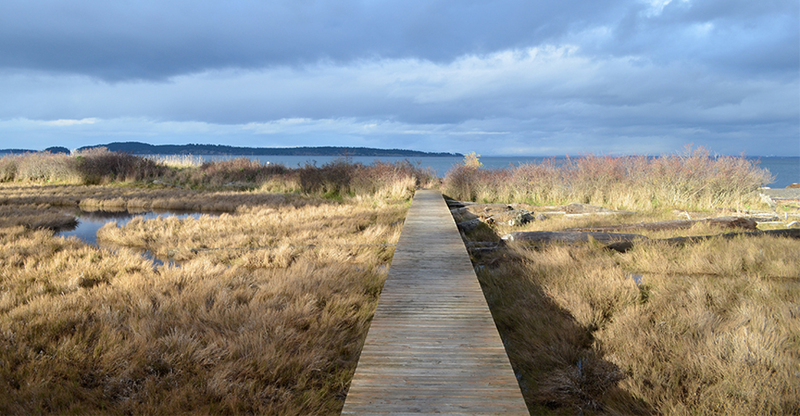 It is about a 40 minute walk along preservation land, trails, and beach into the center of town. The Islands are located about 100 miles north of Seattle, WA. The closest major airport is located in Seattle at Sea-Tac. Most people choose to rent a car in Seattle and drive north to the ferry terminal at Anacortes, WA. The entire trip to Orcas Island, including ferry ride takes approximately 4 hours. There is also air service, leaving from Boeing Field or Lake Union in Seattle. The flight takes about one hour. So about this Ferry thing, Do I need a reservation? YES. HIGHLY RECOMMENDED: Washington State Ferries takes reservations for all San Juan Island routes. Please visit the Washington State FERRY RESERVATIONS website for more information and to book your ferry travel. We STRONGLY recommend making a reservation for all travel times, but especially during peak times to ensure boarding on the ferry of your choice. Every ferry leaves 10-15% of the ferry capacity for standby travel for last minute travel or when reservations are full. Sometimes there is extra space when driver's don't show or cancel their reservations. Though, reservations are your best bet for smooth sailing. HIGHLY RECOMMENDED. A car is a must for touring the islands. Bicycling is possible for experienced riders, but due to hilly terrain and narrow roads with heavy vehicle traffic, we do not recommend this for families with young children. No public transportation options on the island. There are a few taxi services and a private shuttle. Currently no Uber or Lyft on the island. What are the Check In and Check Out? What can guests access at Sleeping Sea? 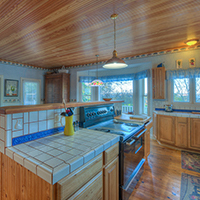 Guests can explore most areas of the property. The beaches in front of neighbor's homes are private and we request that you respect their privacy. Guidelines and policies are available in the suites. We thank you in advance for following. If you have questions, please email or call. 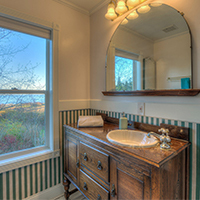 Sleeping Sea's 1.5 acres are shared with vacation guests from both the Beach House and the Beach Loft. There is a communal fire pit and (2) charcoal BBQ's. You must provide your own wood and charcoal. Fires on the beach are allowed. However, all San Juan County burning regulations and bans must be adhered to. You can find more information about outdoor fires from the San Juan County Fire Marshall website and billboards around the island posting current burns. Are there other charges in addition to the posted rate? YES: Local taxes, additional persons, and a pet fee if your canine companion is joining you. Please see our policies for more details. These fees will be made clear during the booking process. We do allow SOME pets, but not in all of our rentals. Be sure to let us know during the booking process that you would like to bring your pet along for the vacation. There is an additional pet fee. Unannounced pets can not be accepted. Please review our pet policies to decide if you will be traveling with your pet to the farm. If pets are approved, we reserve the right to provide pet friendly furnishings or cover furnishings to protect the room. WHERE IS THE COFFEE and What Are The Food Options? We do not provide breakfast, but happy to reccomend some local cafes. Over the years we were wasting LOTS of ground coffee and folks wanted different kinds. We now provide complimentary k-cups for a Keurig machine in the Beach Loft for shorter stays. The Beach House is equipped with a coffee brewer, french press, and a grinder. If you are a coffee connoisseur, please bring your own ground coffee for your suite. You can find a wide selection of all levels of coffee at the local markets. We do not provide Satellite TV, but the Beach House offers a 40" smart TV with a complimentary Netflix. There is no media screen or external movie player in the Beach Loft. Why do I have to dispose of my own garbage? We strongly believe in reducing our waste. This perspective on waste was not solely created from living on an island, but it does amplify the issue. All products for services and business are imported to the islands. Subsequently, ALL waste generated in the islands is transported to the mainland via the ferry. This is a costly and mostly unsustainable effort, so we must all do our part in reduction and reuse. Sleeping Sea will handle your waste removal for an extra fee if you decide not to remove it from the property. If you dispose of it yourself the waste removal fee is waived. Since we compost all food waste and provide recycling containers, it helps alleviate garbage costs and is better for the environment (as well as making our chickens very happy!) We place a compost bin in each of our homes. You mentioned something about water conservation and septic systems. What's this about? We are on septic. So wastewater is treated on site. No city sewer system! This means absolutely nothing down the drains. More information provided upon arrival. Water is SO precious. We are big into water conservation, especially during the extremely dry summer months. It’s a small island surrounded by saltwater. Freshwater is a cherished resource that is only replenished by the rain. Sorry, no bathtubs here!! Instead, consider showering with a friend! 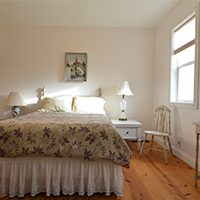 There is parking available onsite for both the Beach House and the Beach Loft lodging guests. Please let us know if you will be bringing additional cars. We are headed to the beach for the afternoon. Do you have any extra towels? One bath towel per person is provided and these towels are NOT intended to be used as beach towels. Please bring your own beach towels. Extra towels available at a fee. This is not a hotel. No room or laundry services are included. What happens if my kid uses their artistic talent to draw a mural on the wall or my dog has a party? You are responsible for any and all damages to the home or unit from the time you check-in until you check-out. For guests with children ages 15 and under, we reserve the right to makes changes to the rooms for protection against hard use and accidents. What services are on the islands? 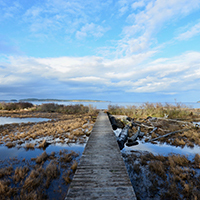 Orcas Island and San Juan Island have town centers with all necessary services. Friday Harbor is the largest town in the San Juan Islands and has numerous stores and two supermarkets. Eastsound Village is the small commercial center of Orcas Island, containing most of the shops, restaurants and the main market for the island. It is located approx. 9 miles from the ferry landing. 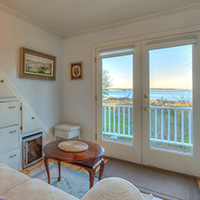 Sleeping Sea Waterfront Suites are only 1.5 miles from Eastsound Village. Once in a Blue Moon Farm is approx. 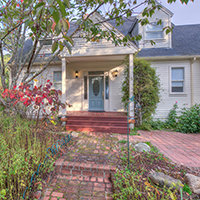 7 miles from Eastsound Village and 2 miles from the ferry landing. Am I going to see any whales? There are resident and transient orca whales as well as lots of other marine life around the islands. Due to noise pollution from recreational and commercial boating, reduced salmon runs and overall pollution in the waters of the Salish Sea, the entire population of Southern Resident Orca Whales is in grave danger of dying. The State government has created a task force to protect and save the whales. There are also many local and national organizations involved with the conservation and preservation efforts. Please educate yourself before choosing how you will interact with the whales on your vacation. They are frequently spotted on the Western shores of San Juan Island. Lime Kiln State Park is an excellent land based watching point where you can actually get closer to the whales than tour boats are legally allowed. These majestic whales are endangered and protected. We recommend land based whale watching out of respect for and the future health of the orca whale populations in the Salish Sea.